Why is it that when work has an element of joy it isn’t work at all, but when you remove the joy, the same work that was once a delight becomes a chore? There are three grands in the playhouse in the backyard when one of them announces they have spilled on the tablecloth. She had a vested interest in the tablecloth; she helped sew it. They can all sew a straight line, which means they are now on a skill level with their grandma. The concept is foreign to me. I returned from the house with an old washboard that hangs over the washer and dryer. She is delighted. Thrilled. Ecstatic. Who doesn’t jump up and down at the prospect of scrubbing something out by hand with a tub of cold sudsy water and an old washboard? So, there she is going to town with the tablecloth and the washboard, having a wonderful time, and I am having a wonderful time sitting in the shade watching her work. That’s probably one of my favorite elements of work – watching someone else on task. My very favorite element of work is listening to someone else vacuum. Music to my soul. There’s a pattern here, isn’t there? She finishes the tablecloth and announces her dress needs washing. She dashes to the house to put on some old clothes from the “emergency” drawer and begins washing her dress. Her sister announces that her dress needs washing, too. The desire to work has now grown contagious. If only we could package and market this fervor. Another sister announces she wants to wash something the old way, but must be in costume. She dashes inside and returns wearing a long dress, a straw hat and an apron that belongs to Raggedy Ann. They have all had turns at the washboard and announce they need to dry their wet things. “Just throw them over the chairs on the patio,” I say. Isn’t that how it goes? You sanction cutting corners and someone wants to go for authenticity. We string the rope from one end of the hammock frame to another and voila, a portable clothesline. 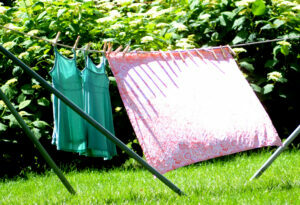 Their dripping wet articles flap in the breeze and they push the hammock around the yard to follow the sun. Later that night I retrieve their things from the clothesline. The small tablecloth and little dresses are stiff, as are most things that dry in the wind. At 10 p.m., I push a few buttons on the washing machine and toss their tiny things in with a load of towels. It’s not a chore; it’s a delight. I don’t stay inside and read books all summer, it’s just that I’m one of those people who don’t tan. I’m naturally pale. Very pale. I’m so pale I nearly glow in the dark. Can’t find something in the back of your closet? Call me. I can wave my arms around and you’ll find things you forgot you owned. Naturally, every year I think this might be the year I spend a few hours outside and inexplicably develop a lovely golden brown tan. Of course, I don’t. So then I think maybe this is the year there’s a product that will give me a natural-looking golden brown tan. I’m a marketer’s dream when it comes to self-tanning products. I first tried one when I was a girl of about 15. The advertisement promised it would turn my anemic-looking skin into a beautiful bronze and make me vastly more popular at the ocean’s shore. That was impressive, especially considering that the nearest ocean shore was 1,000 miles away. I figured if one coat would make me bronze, two coats would make me very bronze. I slathered on three for good measure. The next morning, I awoke and found that the lotion had indeed delivered results. I looked like a human carrot. My mother screamed at the sight of me and rushed for her medical book. I gave up on self-tanning lotions until about a decade ago. There was a new product, a paper towel of sorts, saturated with a lotion that would turn your skin a beautiful golden brown. The instructions said to apply it with circular motions. I woke the next day with circles on my face and arms that made me look like a leopard. The next year, I tried a foam that said to apply it in vertical motions. For six days I walked around with stripes on my legs and arms that looked like a zebra. I’m finished trying to be someone I’m not. I have finally made peace with being pale in the Age of Bronze. As a matter of fact, our local symphony does outdoor concerts every summer. I’m thinking of volunteering as an usher. I’m pretty sure we’ve done a full reverse on that one. We put an exceedingly high premium on fame these days. To paraphrase the late historian Daniel Boorstin, we have people who are famous for simply being famous. They haven’t done anything particularly noteworthy, but they do take marvelous selfies. We are all wooed by the allure of fame these days. The varied possibilities of fame are the opioids of social media— follow me, friend me, like me, share my post, retweet my tweet. We are nearly desperate for fame. A friend who pastors a church in the inner-city described a street brawl in front of his family’s home one evening. It was a group of mostly women, some with children in tow. The police said it would be a little while before they could get there, so in the meantime, our friend began taking a video. Usually when a mob sees someone pull out a cell phone, they disburse because they know they can be identified. Not this time. This time a brawler momentarily broke from the mob and asked our friend if he’d send him the video. The man confused fame with infamy. It is often a fine line between the two. 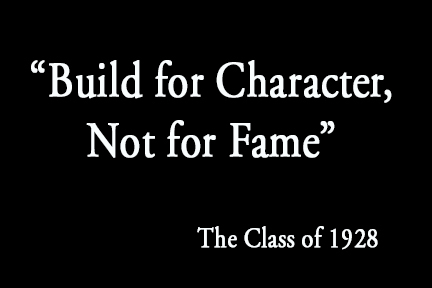 “Build for Character, Not for Fame,” is based on the assumption that one is looking up and ahead. That’s an encouraging thought, especially today, when most of us have our heads down, crooked over screens. Looking ahead and building for character takes thought and intentionality. One can be intentional in building for fame as well, but the components of fame are often circumstantial. Fame relies heavily on the right timing, right externals, right connections and cultivating a base of fans and supporters. Character is rarely circumstantial and not subject to the whims of others. Character is built with self-discipline, a willingness to learn from difficulties and humility. Character grows internally and needs no applause. Fame depends on people looking. Character is who you are when no one is looking. Fame is often laced with an inherent jealousy, a constant, low-grade anxiety that the clock is ticking, fear that someone better able to please the crowd is closing in from behind. Character is marked by contentment and generosity. There is satisfaction that comes with the reward of accomplishment, but at the same time good character willingly holds the door for others also hoping to achieve. This commencement season, speakers will tell new graduates to get out there and build a better world. The best way to build a better world is to build character, the kind that runs deep and can carry you through life’s storms. Build character with prudence, courage, justice and fortitude. Build character by respecting yourself and respecting others, because we have all been made in the image of God. Build character with faith, hope and love. 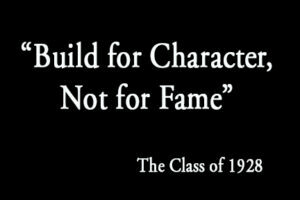 Build for character and you will build a better world. She’s tiny for 2 years old, on the petite side with delicate features and a voice like the whisper of a summer breeze. She’s tiny but tough. You have to be when you’re the youngest of four. Mom and Dad are gone today. They left while she was sleeping, just after midnight. They’ve gone to the hospital for the delivery of baby No. 5. The family lives on the top floor of a Chicago Greystone more than 100 years old. The old house has huge windows with beautiful wood molding and ledges so wide an adult can sit on them. She is curled up in one of the windows. 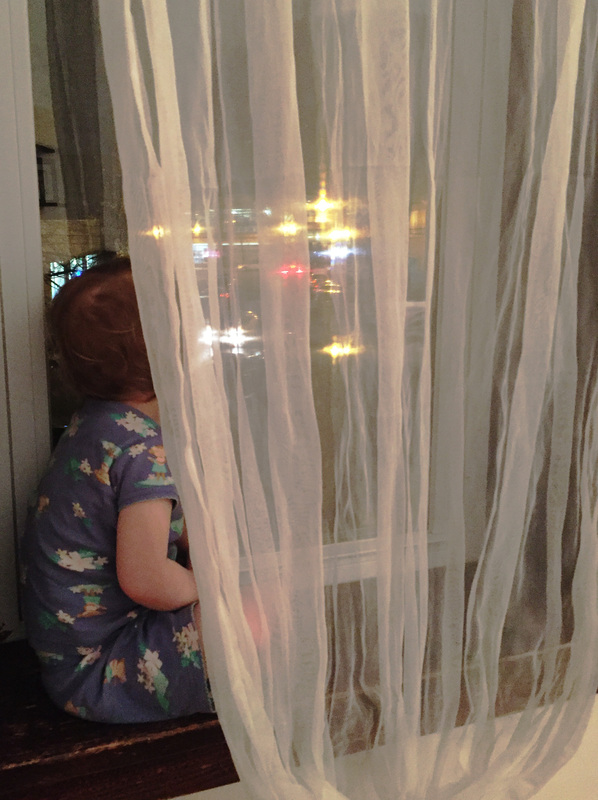 She gingerly climbed over the radiator, which never gets more than a middling sort of warm, took a seat on a window ledge and wrapped her little arms around her little legs, which are pulled up to her chin. 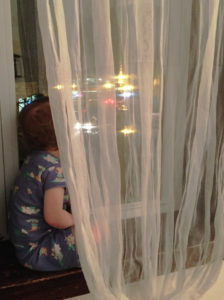 She’s watching the action on the street below—cars passing, motorists parking, people walking briskly with morning coffee in one hand and cell phones in the other. Delivery trucks zip by and a mail carrier pushes his canvas-like wheelbarrow along the sidewalk. Meanwhile, her next-in-line brother has gotten out a microscope. He’s peering at slides, alternating looking with his right eye, squinting with his left, looking with his left, squinting with his right. Her next older brother is tinkering with squishy circuits, a conductive play dough in which he arranges electrical circuits and fires up tiny lightbulbs. Her big sister just brought up a load of a laundry from the cellar, three flights of rickety stairs down. Now she’s doing a word search, working on earning a paleontologist badge from the National Parks Service. Of course, it’s not nearly as tranquil as it sounds. Skirmishes intermittently erupt and they all take turns testing Grandma and Grandpa’s limits and response times. All except the little one. Late afternoon, they are lined up on the sofa watching an animal show. From a distance it looks like the little one’s eyes are glistening. Tears are welling. Tears tumble down her soft cheeks. I hold her and soon she’s fine. After dinner, she climbs into the window again. The length of the street is ablaze with headlights, taillights, stoplights and streetlights. But it’s not the dazzling lights holding her gaze. She’s looking hard at each car, each passerby. She’s looking for Momma. When I pick her up to put her to bed, she lays her head on my shoulder, whispers “Momma,” and starts to sob. Tears soak my neck. I rock her awhile and sing a lullaby over and over. I lie down next to her, my arm wrapped around her small body. When she’s finally asleep, I pull my arm away and wrap her sister’s arm around her. She’ll be at the window again in the morning, looking for the one who makes her feel completely safe and protected, the one who makes her eyes dance and her entire being shine. Oh, that every child would know the warmth and strength of a loving momma.